Apple on Wednesday announced its "Holiday Cheer" Christmas playlist in the Apple Store app, inviting users to download eight holiday classics for free from the iTunes Store. 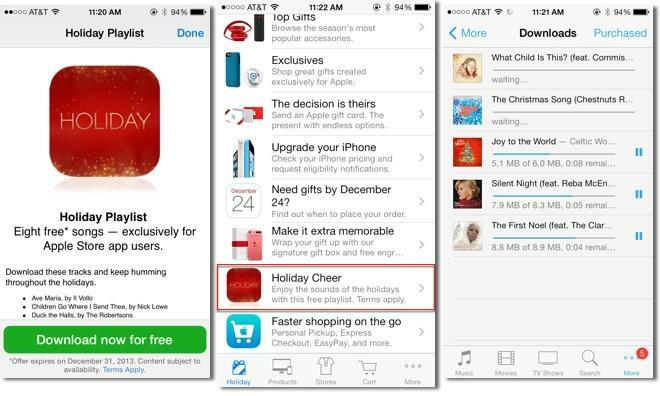 The Holiday Cheer initiative is another exclusive to the official Apple Store app meant to drum up interest in the title. Previous promotions included free apps downloadable through the iOS App Store. For the Holiday Cheer freebies, Apple has selected eight Christmas tracks that can be downloaded for free from iTunes via a unique redemption code. The offer expires on Dec. 31, and the company warns content is subject to availability. As for the specific cuts, Apple is giving away "Ave Maria" by Il Vollo, "Children Go Where I Send Thee" by Nik Lowe, "Duck the Halls" by The Robertsons, "Joy to the World" by Celtic Woman, Silent Night" by Kelly Clarkson, "The Christmas Song (Chestnuts Roasting on an open Fire)" by Kool and the Gang, "The First Noel" by Mary J. Blige and "What Child is This" by Marvin Sapp. The Apple Store app can be downloaded for free from the iOS App Store, while further promotions are expected to continue as Christmas draws near.